Sister Mary Ellen Robinson types as other Yakima Mission Centre members collaborate on the wording of their letter. The group included Terry Mullen, SNJM (in blue striped sweater), Blanca Bazaldua, Associate, Maureen O’Brien, Associate, Ann Dibble, Associate, Dalia Villareal, Associate (behind Ann), Bengie Aguilar, Associate, Marina Rose Parisi, SNJM, Mary Rita Rohde, SNJM (behind Mary Ellen), Mary Ellen Robinson, SNJM, Cecilia Chavez, Associate, Tom Gehlen, Associate. Photo credit: Charlyne Brown, SNJM. A discussion around the dining room table at Kateri House in Toppenish, WA led to a decision by Yakima Mission Centre members to write to the bishop of Yakima about supporting immigrants and refugees. 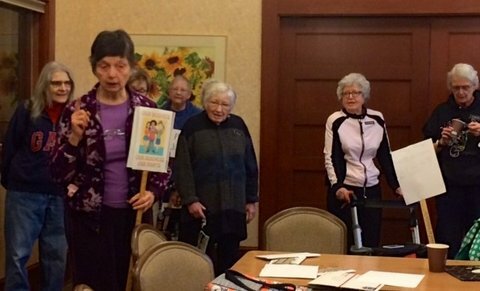 At their Feb. 11 meeting, five Sisters and seven Associates shared the energy they feel about advocating for migrants and refugees, which emerged as a major priority during the SNJM community’s 34th General Chapter in July 2016. Most of those at the meeting work and/or volunteer with immigrants, and all have immigrant neighbors, friends and extended family. In their letter to the bishop, the Yakima Mission Centre members quoted from the Acts of the 34th General Chapter and asked to meet with him to see how they can more effectively collaborate with him in current and future diocesan support for immigrants and refugees in the Yakima Diocese. 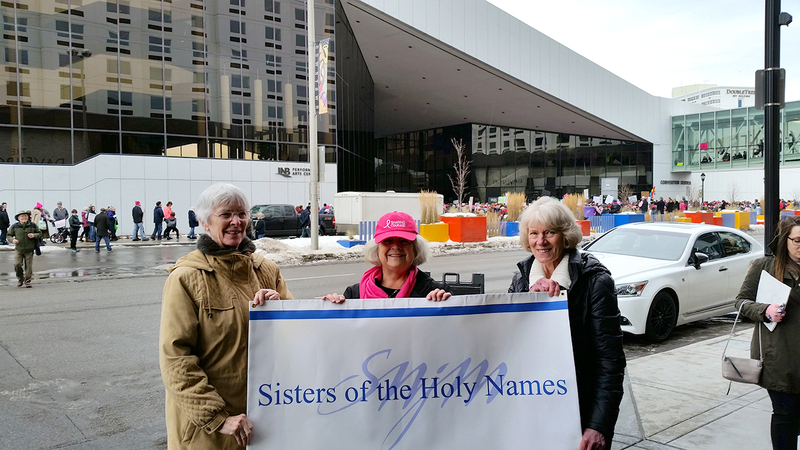 As Sisters of the Holy Names of Jesus and Mary of the U.S.-Ontario Province, a community of over 430 Catholic women religious, we were astounded to learn that refugees were being turned back and refused entry to the U.S., even though they had valid visas from our country. We join with other concerned citizens and members of many faiths in opposition to this action, since it is contrary to the values of our nation, our faith and our religious congregation. The earliest members of our community – following Jesus’ message “I was a stranger and you welcomed me” – rescued Irish immigrant orphans abandoned at ports along the St. Lawrence River and housed them in their schools. Some Sisters in our congregation today in Canada and the U.S. sponsor or operate temporary homes, especially for women and families who are victims of economic or religious oppression, or refugees from war-torn countries throughout the world. 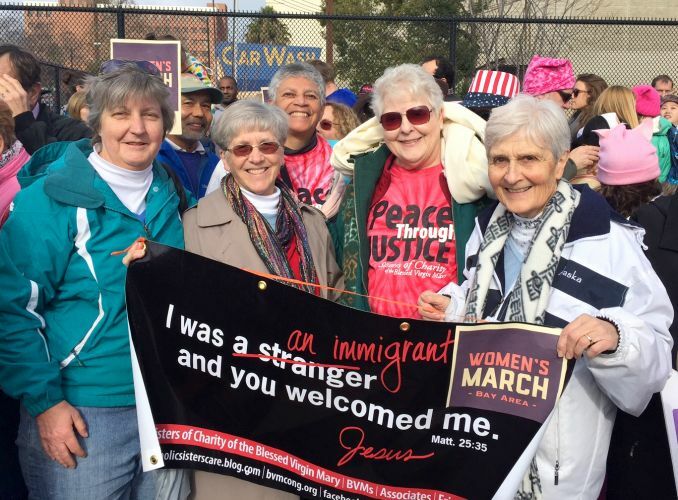 Sisters in every large city where we are located are collaborating with others in local programs to assist refugees and immigrants as they become acclimated to a new home, a new country. Some of our Sisters are refugees themselves; most of our members are children of immigrants. We reverence the Muslim women, their families and their stories when they join with us at various holidays. We pray for the safety of this country and invite persons of all faiths, people committed to justice, to join with us in prayer and action for a just and reasonable resolution to this unacceptable refusal to accept and welcome these immigrants displaced from their home countries by such violent and unjust oppression. They, too, have a right to safety and care. 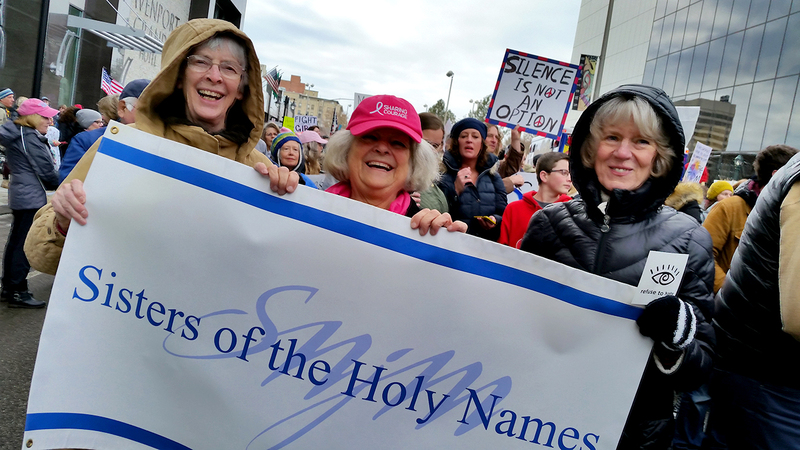 Sisters of the Holy Names poured out messages of love, welcome and inspiration at historic Women’s March activities throughout the U.S. and beyond last weekend. 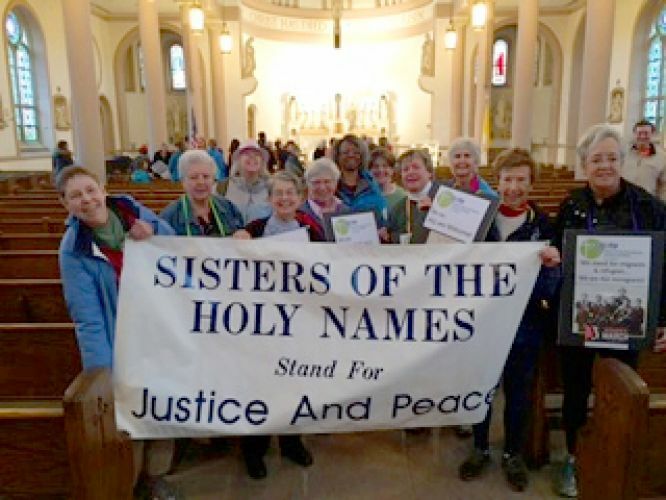 In Washington, DC, Sisters prayed with women religious from other communities at St. Peter’s Church before heading out to march among family members, friends, alumnae of their schools and many new faces as part of the largest march in the nation. 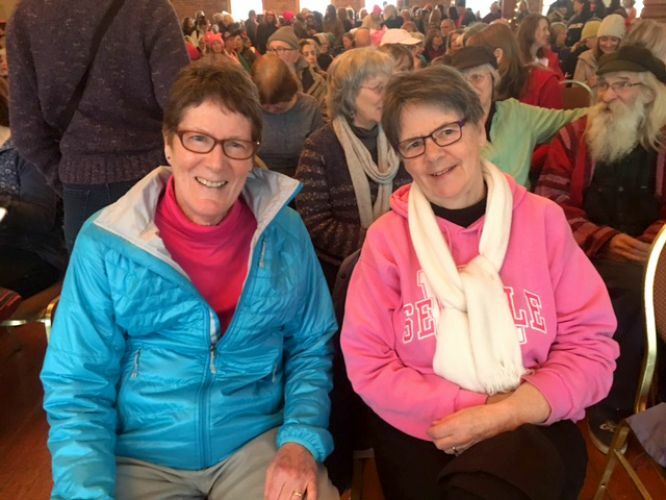 The group included Sisters Kathleen Keller, Jo’Ann De Quattro, Frankie Barber, Maureen Delaney, Barbara Spears, Carroll Ann Kemp, Ann Marean, Teresa Shields, Pat Corbey and Associate candidate Sheila Wooters. 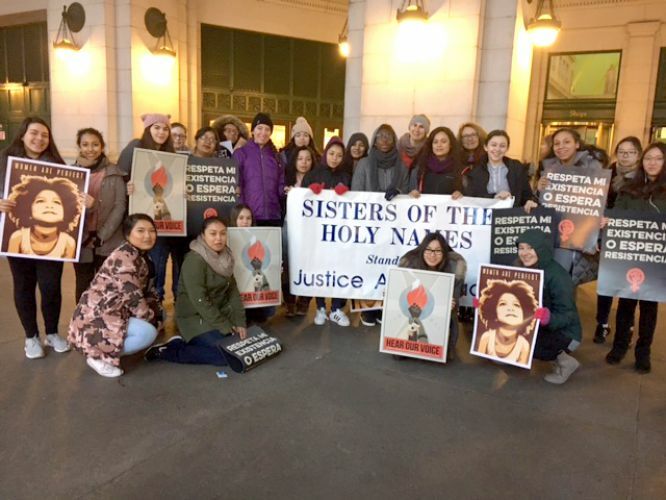 Also in the U.S. capital for the massive march were students and staff from Holy Names High School, founded as an SNJM institution in Oakland, CA in 1868. The Sisters embraced the chance to find common ground and connect with countless people from different locations and cultural backgrounds. 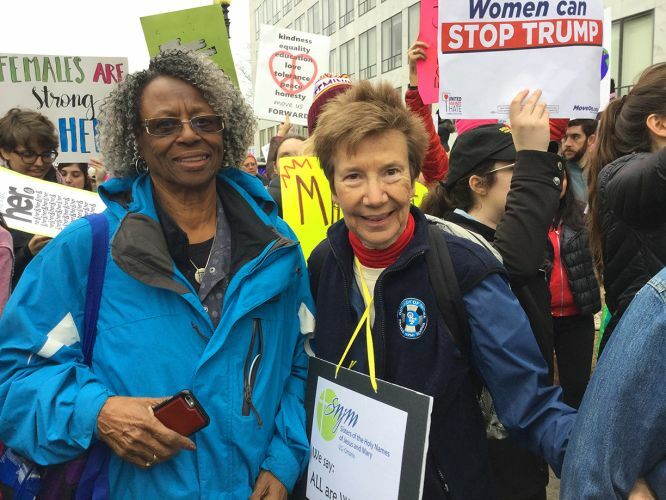 In Oakland, CA, Sister Rosemary Delaney marched with a SNJM group that included Sisters Cynthia Canning, Rosemary Delaney, Diane Enos (with her sister from Hawaii), Carol Nicklas, Barbara Nixon, Dianne Nixon, Sophia Park, Mary Sullivan and Associate Rosemary Brennan. 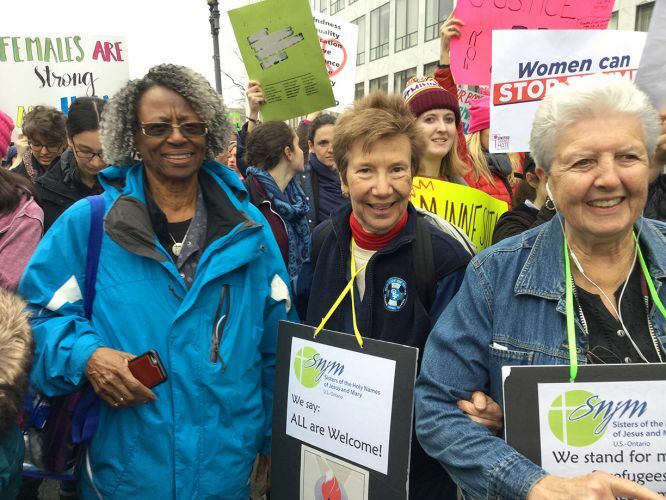 Sister Barbara Raymond also marched in Portland alongside a large contingent from Adelante Mujeres, an SNJM-supported organization committed to education and human rights for immigrants. 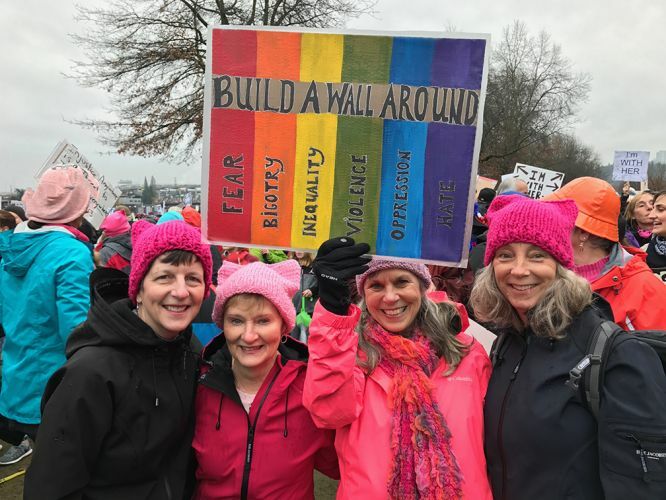 Some others went to their local march individually or in small groups, like Associate Delphine Busch and Sisters Judith Mayer and Mary Ann Farley in Portland, Associate Ann Dibble in Yakima, WA, Associate Chris Hillman in Seattle, and Sisters Cathy Beckley and Peggy Kennedy in McMinnville, OR. 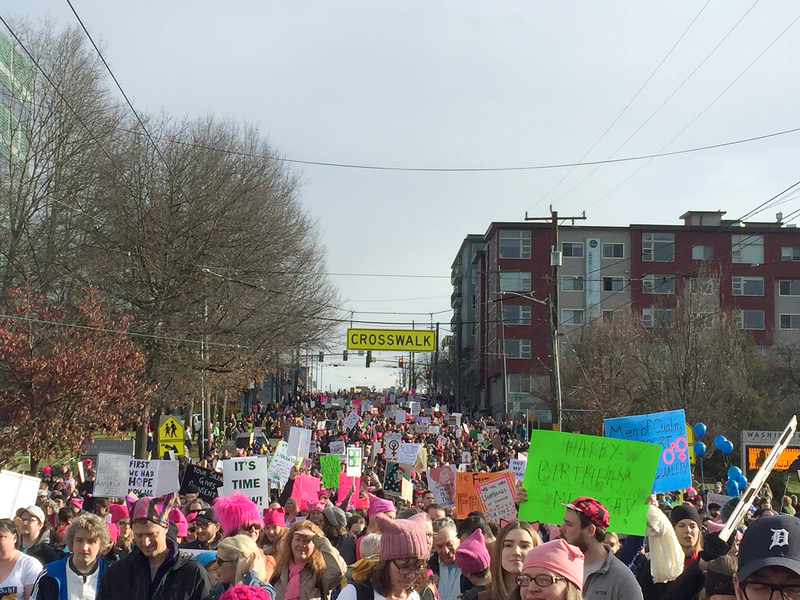 A few people ran into each other by happenstance; others simply joined the nearest marchers. 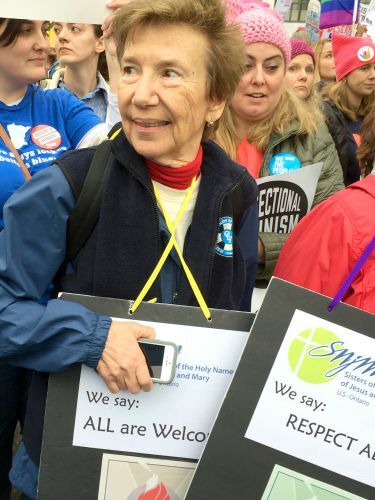 Meanwhile, Sister Mary Pat Naumes and a friend marched alongside about 8,000 Southern Oregonians in Ashland, OR. 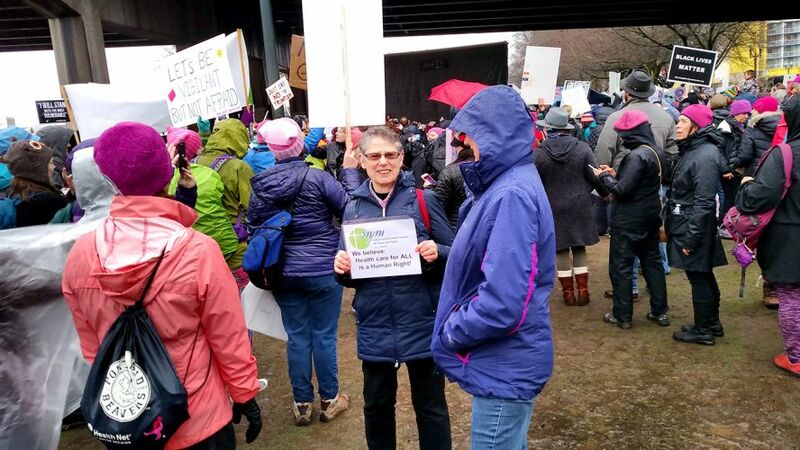 To the north, Sister Anne Bosserman, Associate Yvonne Lopez-Morton and Associate Sally Duffy carried a banner in the Spokane, WA march. 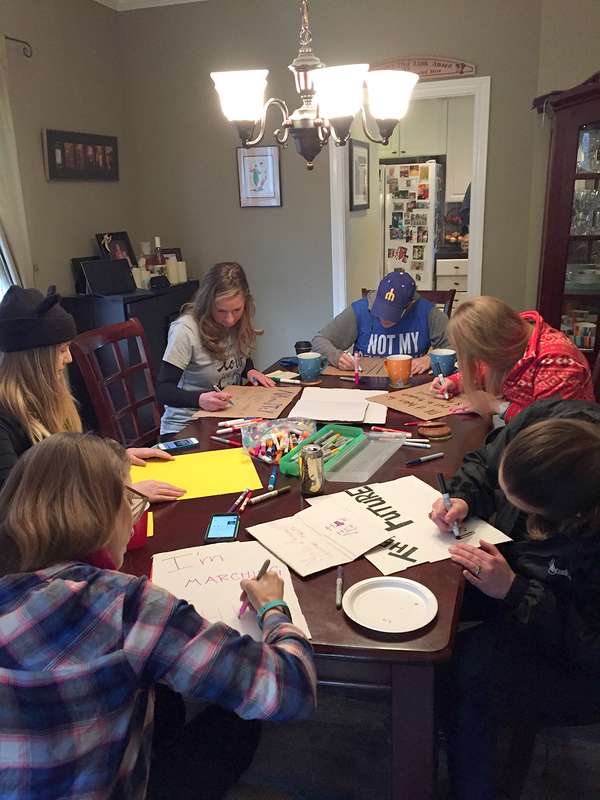 In Seattle, WA, Holy Names Academy faculty and students held a sign-making party before heading out to join an estimated 175,000 marchers, reported Associate Julie Tilghman, HNA Campus Minister. 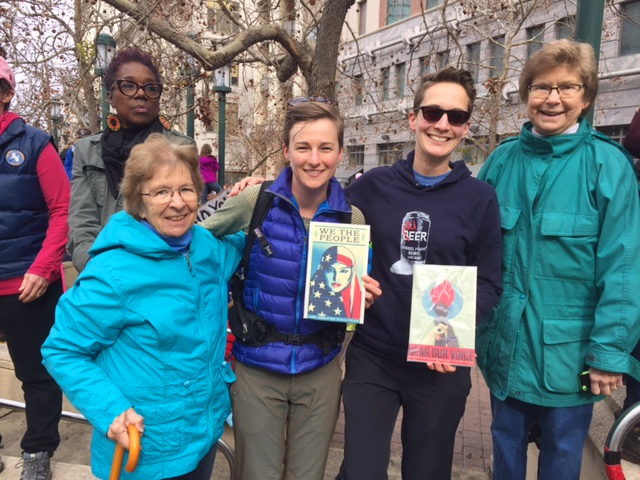 Sister Susan Maloney noted that her late mother, Vera Gaeta Maloney, who graduated from Oakland’s Holy Names High School in 1936 and sent all five of her daughters there, was an inspiration to her during the march. 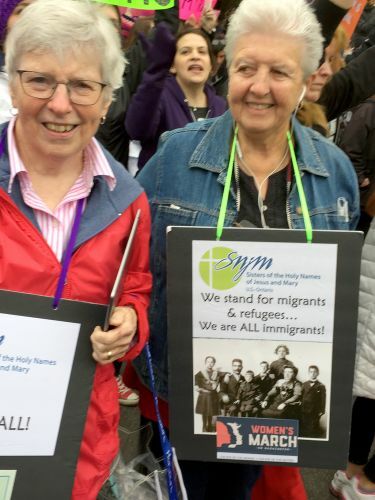 In fact, the five Maloney sisters honored the spirit of women’s education and of SNJM foundress Blessed Mother Marie Rose Durocher as all took part in the march in different parts of the world. 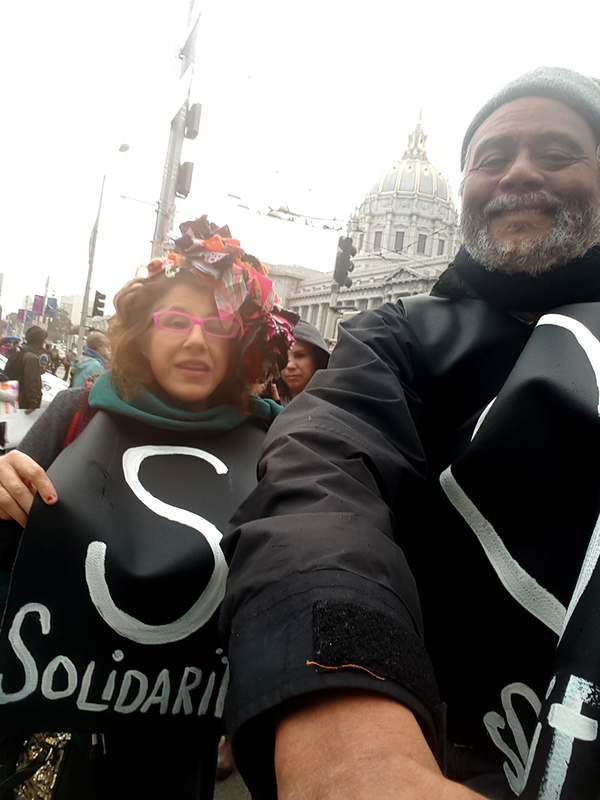 Sister Susan and Nancy Maloney marched in Oakland, CA, Kathy Maloney in Las Vegas, NV, Mary Anne Maloney-West in San Francisco, CA and Joanne Maloney-Chiarelli in Bologna, Italy. 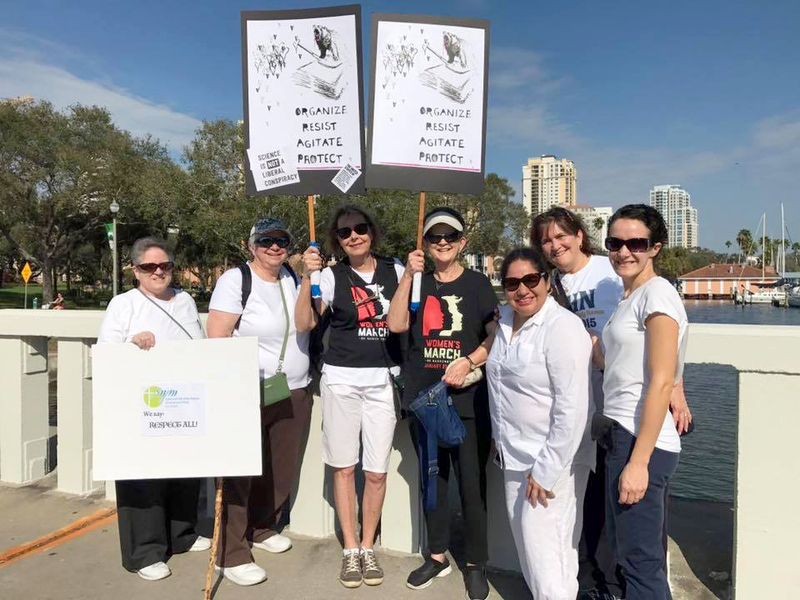 In Florida, Holy Names Sisters and Associates teamed up with faculty and friends from the Academy of the Holy Names, Tampa to participate in the march. Among them were Sister Mariellen Blaser, Associate Pat Torres, Associate candidate Sharon West, retired AHN Spanish teacher Alice Newell, Associate Cecilia Vargas, Associate Maureen Raimo, Sister of the Immaculate Heart of Mary Lisa Perkowski, who heads the AHN art department, Sister Dolores Wehle and Jennifer Perrella, a graduate whose mother is Associate Judy Perrella. 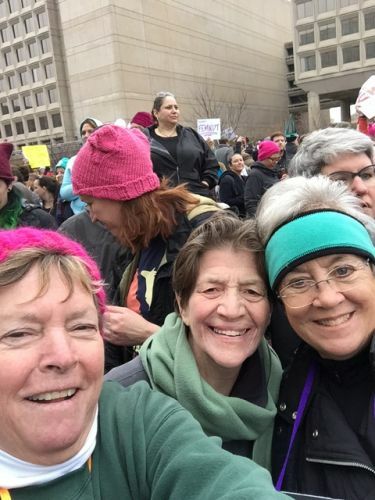 Sister Kathleen Callaway, President of Ramona Convent Secondary School in Southern California, reached out to the schools alumnae on social media, asking those on Facebook where they had marched. About two dozen responded, with results ranging from both coasts of the U.S. to Barcelona, Spain. 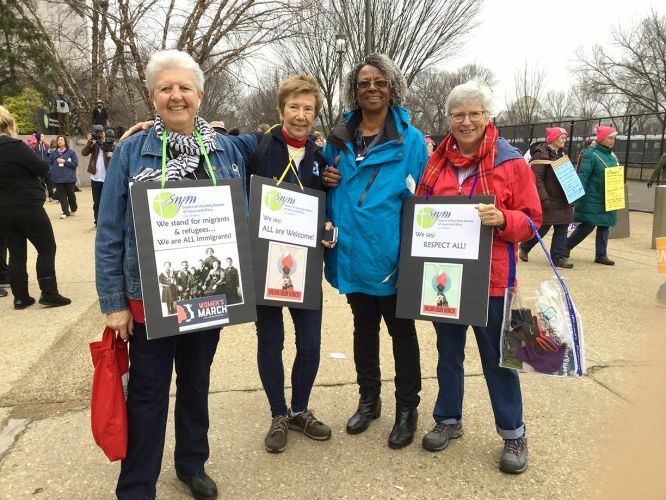 Sister Donna Hortsch, in the midst of recovering from the flu and contending with wintery weather, found a way to participate and share the spirit of the march with others without even going outdoors. She put up a sign at the SNJM-founded retirement center of Mary’s Woods south of Portland. 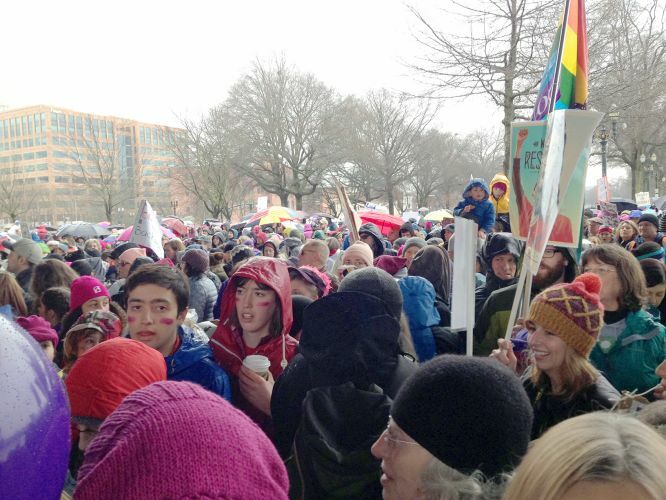 “I found that many were interested but hesitant to go into town or march outside,” she said. “We had about 30 people, including many men. 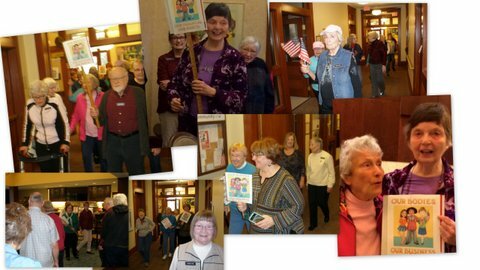 We met at end of the main hall in the Sandpiper room and marched to fireplace in new resident lounge… We used women’s great power of silence.” Some carried signs shared by Sister Jo’Ann De Quattro that Sister Donna downloaded and printed; others made their own. Many Sisters and Associates found other ways to support the march, either by donating funds to help those who attended or praying for them. 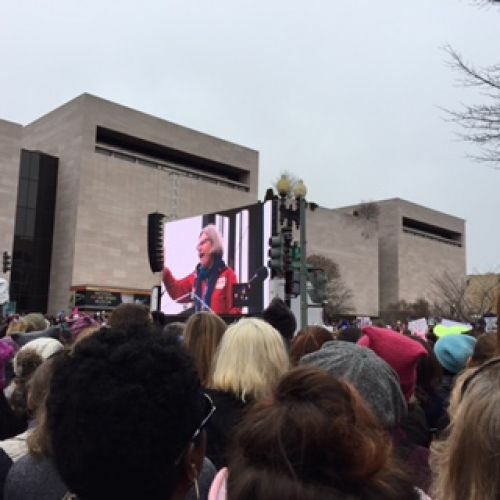 During the day of women’s marches throughout the world, both small and large acts of solidarity brought the SNJM community together, looking to the future with faith and conviction. Mary Haupt, SNJM, Bette Gambonini, BVM, Elizabeth Avalos, BVM, Marilyn Wilson, BVM and Kate Ondreyco, SNJM. 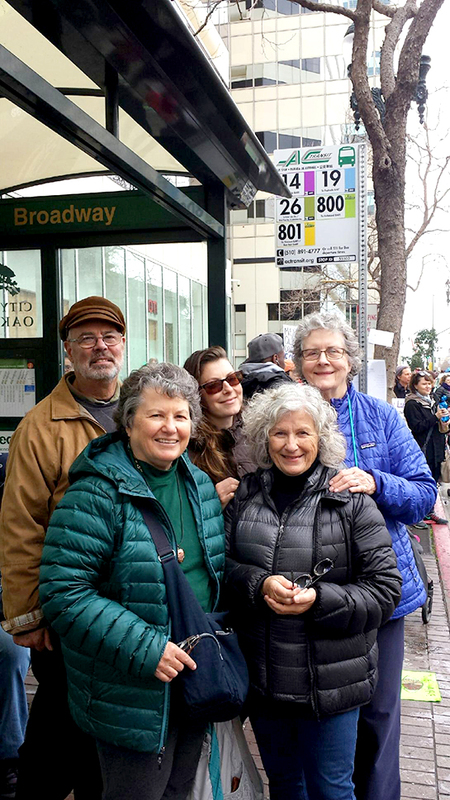 Also attending the San Jose March were Rosemary Everett, SNJM, Fran Kearney, SNJM, Mary Becker, SNJM and staff member Alicia Puppione with her family. Barbara Spears, SNJM reads before the March in Washington, DC. 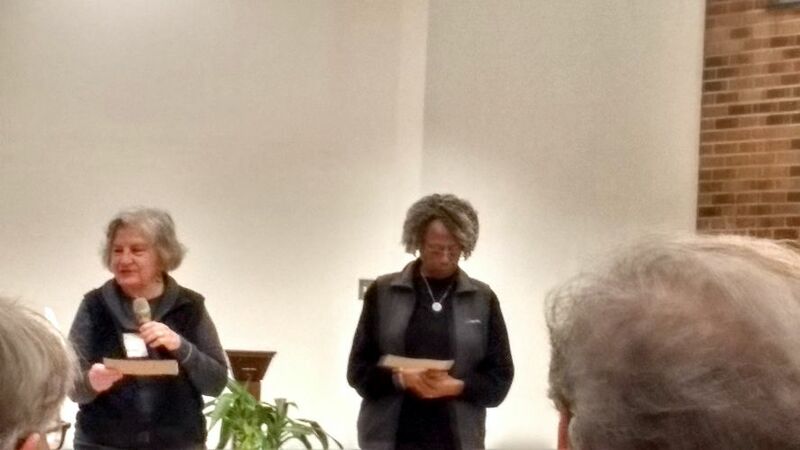 Barbara Spears, SNJM reading at gathering the night before the March for nonviolent participants. St. Peter’s Church gathering prior to March. L-R: Kathleen Keller, SNJM, Jo’Ann De Quattro, SNJM, enthusiastic unknown marcher, Frankie Barber, SNJM, Maureen Delaney, SNJM, Barbara Spears, SNJM, Carroll Ann Kemp, SNJM, Sheila Wooters, Associate candidate, Ann Marean, SNJM, Teresa Shields, SNJM, Pat Corbey, SNJM. Barbara Spears, SNJM, Teresa Shields, SNJM and Jo’Ann De Quattro, SNJM. Barbara Spears, SNJM and Teresa Shields, SNJM. L-R: Sheila Wooters, Associate candidate, Carroll Ann Kemp, SNJM and Pat Corbey, SNJM. On the screen is Simone Campbell, SSS. This was as close as Maureen Delaney, SNJM, Teresa Shields, SNJM, Barbara Spears, SNJM and Jo’Ann De Quattro, SNJM got to the rally. Thanks to Barbara’s determination that those of us who came from a distance should at least get close enough to see this much. We stood here from 10 a.m. to just before 3 p.m. We were unable to move from our spot until the rally ended, then we were able to march. 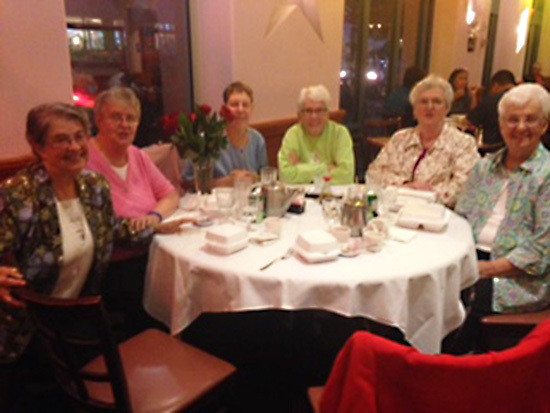 We never saw the other people who were part of our group until we met at a predetermined restaurant in Silver Spring! 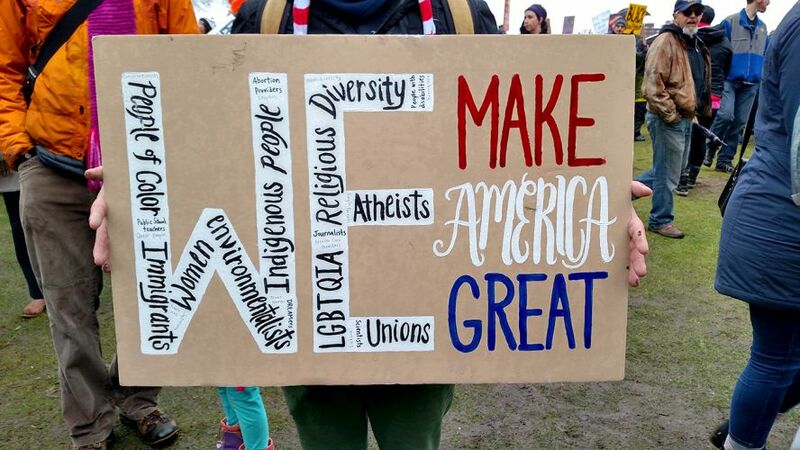 Students at the Women’s March. 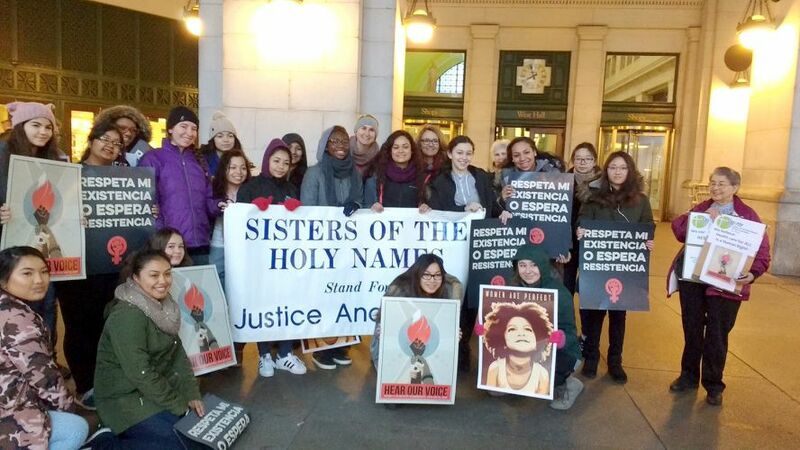 Holy Names High School students at the Women’s March in Washington, DC. 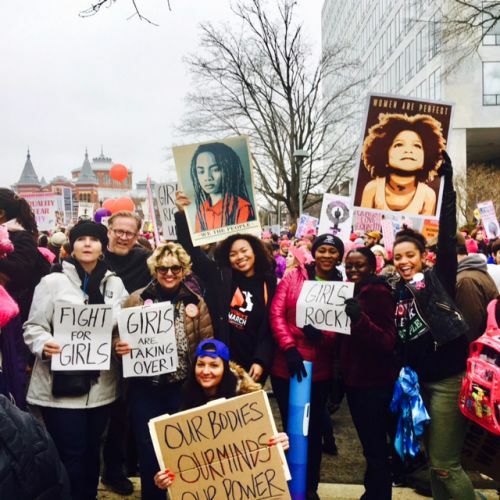 Holy Names High School students with Frankie Barber, SNJM (at far right) at the Women’s March in Washington, DC. Maureen Delaney, SNJM and Jo’Ann De Quattro, SNJM. 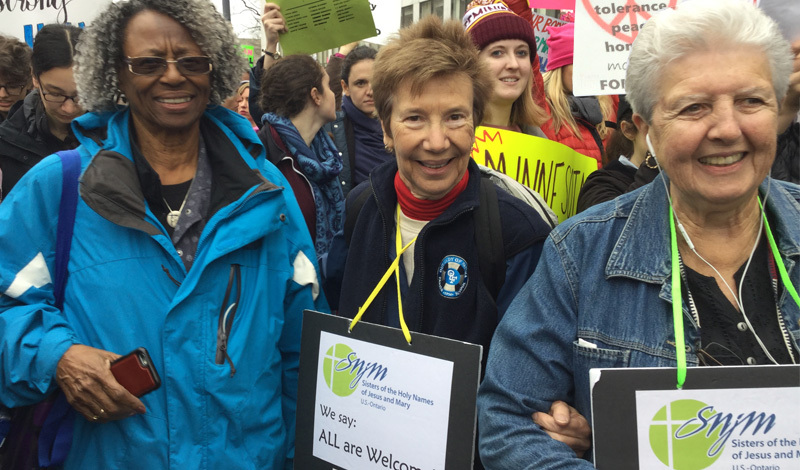 Kathleen Hilton, SNJM marched as part of a three-generation Hilton family delegation at the Women’s March on Washington, DC. 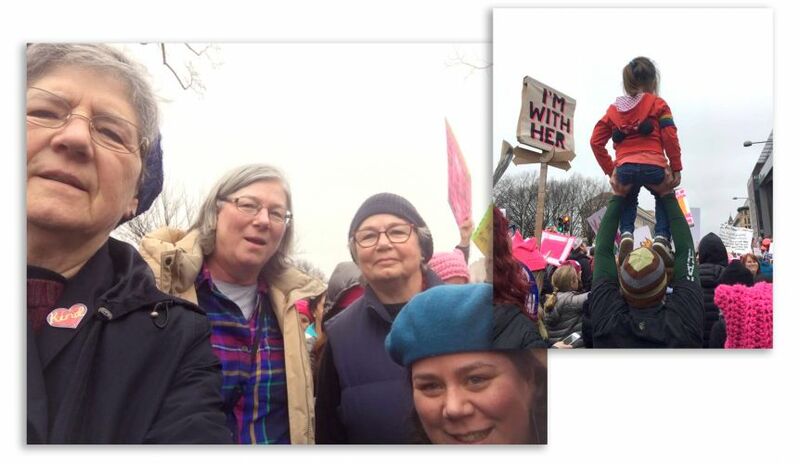 L-R: Sr. Kathleen, Judith Brusseau (HNA ’69), Mary Hilton (HNA ’64), niece Rebecca Brusseau and grand-niece Ariel on her father’s shoulders. 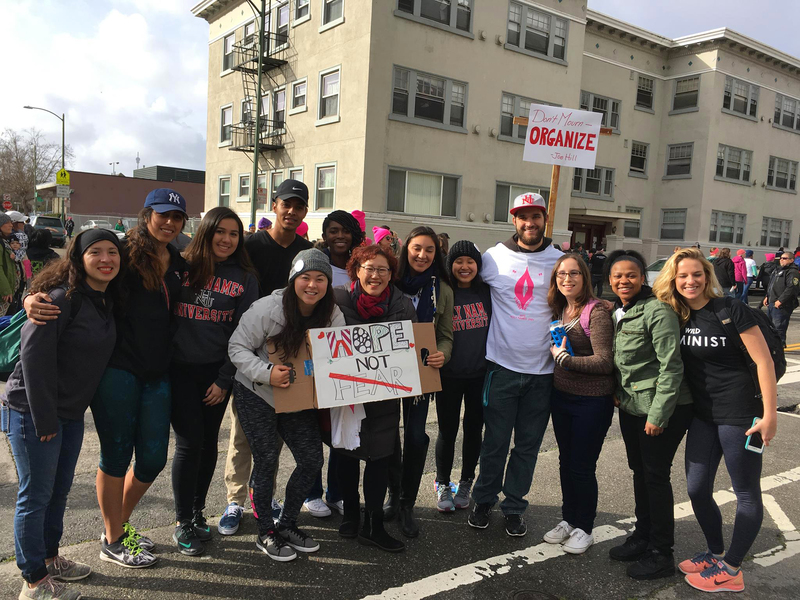 Ann Rice, Associate was proud to participate in the San Jose march with so many others. 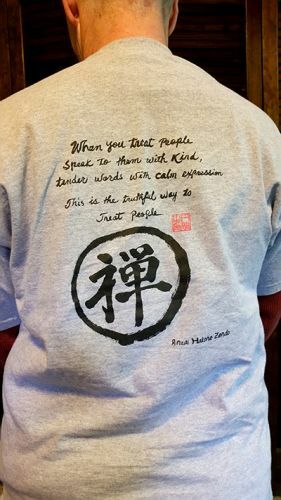 As an Associate and Buddhist priest, this is a picture of the t shirt she wore, to promote peace, equality, inclusivity and compassion. Mary Ann Farley, SNJM and marchers. 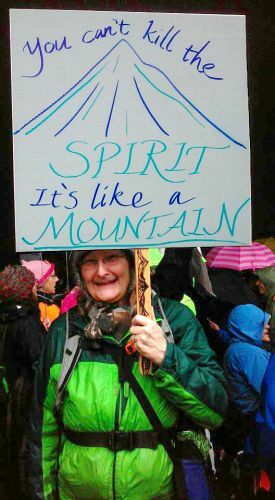 Frodo Okulam, Associate at the Women’s March in Portland, OR. 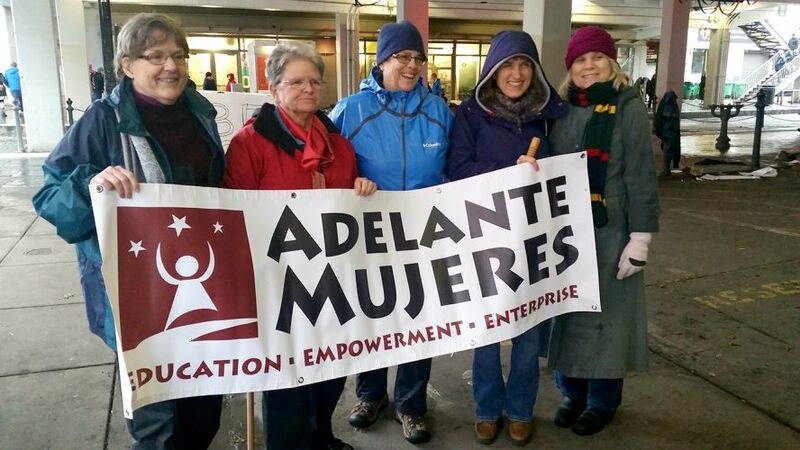 Adelante Mujeres marchers in Portland, OR. Barbara Raymond, SNJM second from left in red coat. 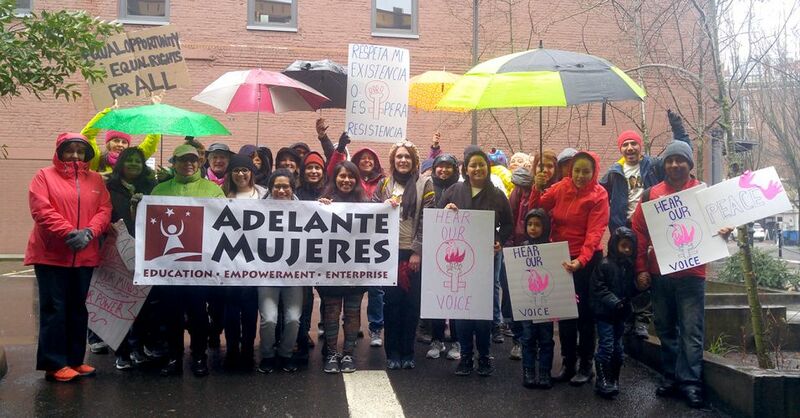 Adelante Mujeres marchers in Portland, OR. Linda Brunner, on far left, was a teacher at Holy Redeemer. The view Linda Patrick, SNJM saw near downtown Portland’s waterfront, just before the people began to move. She could see people streaming over the bridges to join the march. 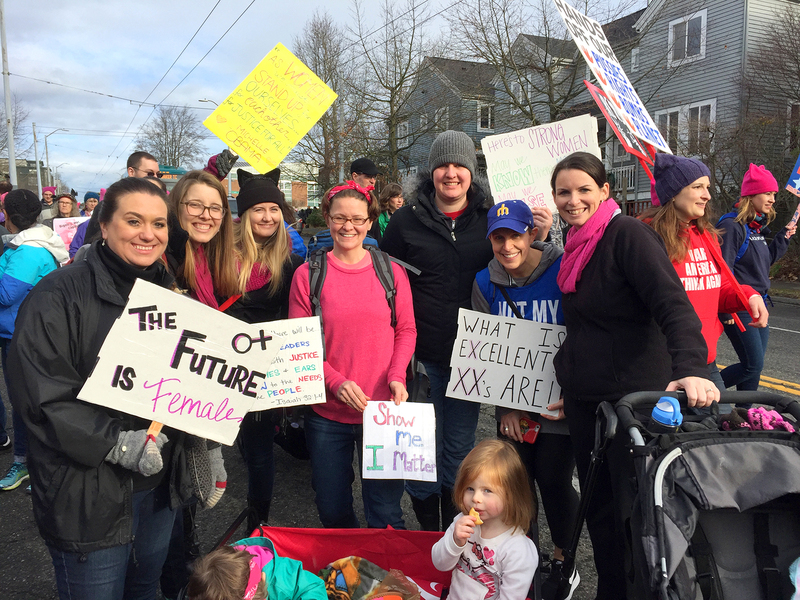 Holy Names Academy, Seattle students preparing for the Women’s March. 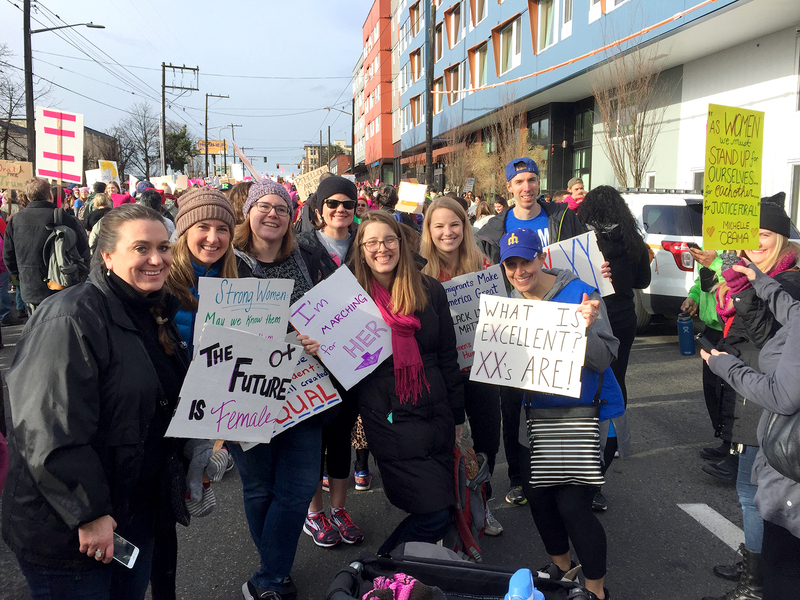 Holy Names Academy, Seattle students prepare for the Women’s March. Holy Names Academy, Seattle students at march. Anne Bosserman, SNJM, Associates Yvonne Lopez-Morton and Sally Duffy. 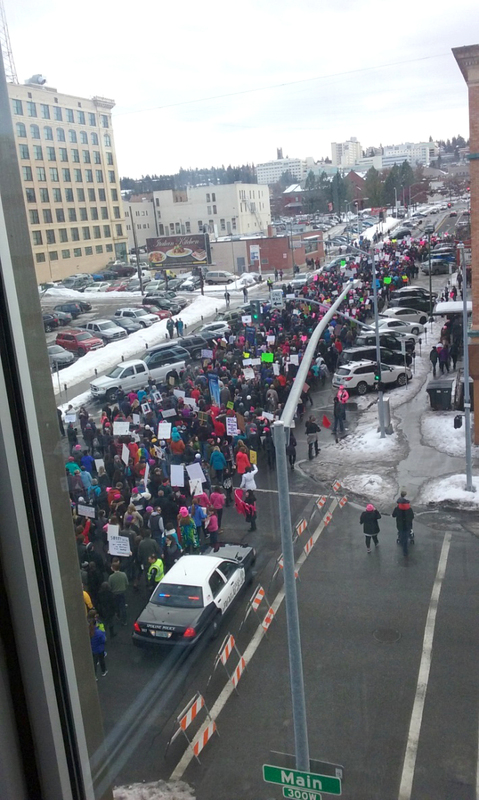 The Spokane March, which Karen Conlin, SNJM participated, was led by indigenous people. 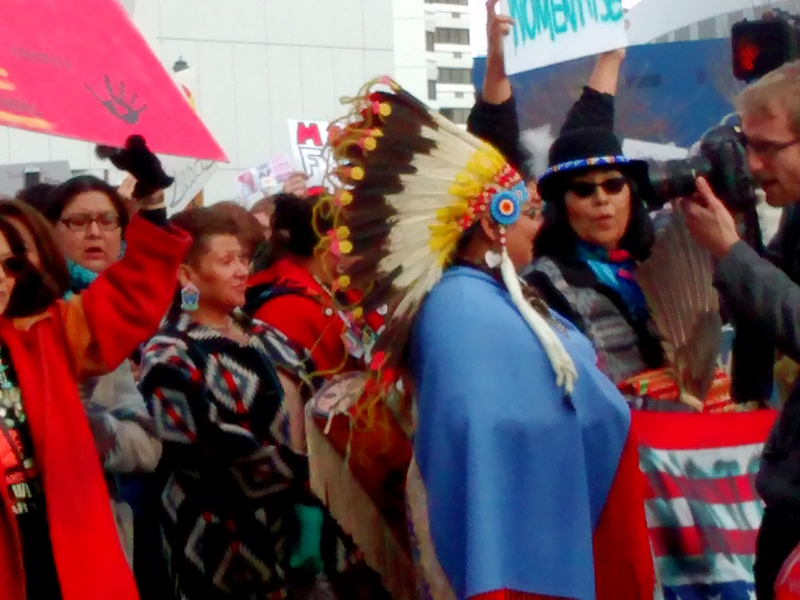 The men have the amazing head dresses, but there were mostly native women leading. From left to right: Pat Torres, me, Sharon West, Alice Newell (retired AHN Spanish teacher), Cecilia Vargas, Maureen Raimo, and Lisa Perkowski, IHM, head of the AHN art department. Dolores Wehle and Jennifer Perrella (a grad and daughter of Associate Judy Perrella) were also there. Joanne Maloney Chiarelli (HNHS 1971) marched in Bologna, Italy where she lives with her family. She teaches at the University of Bologna. 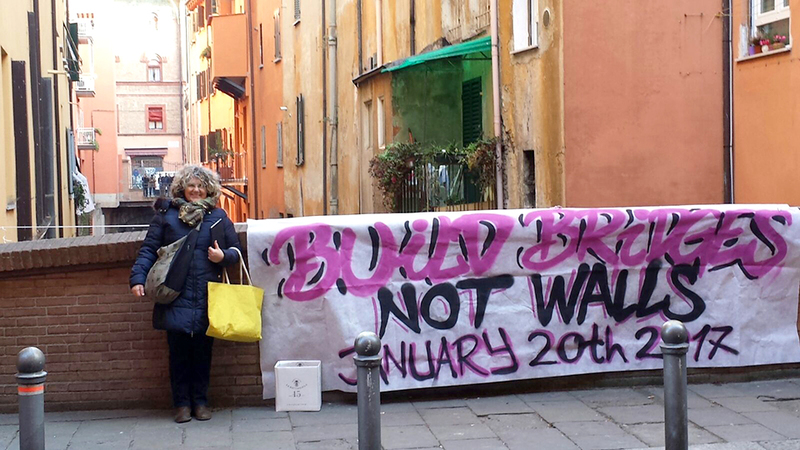 She is chair of Democrats Abroad committee in Bologna, Italy and is a strong advocate for women’s rights. 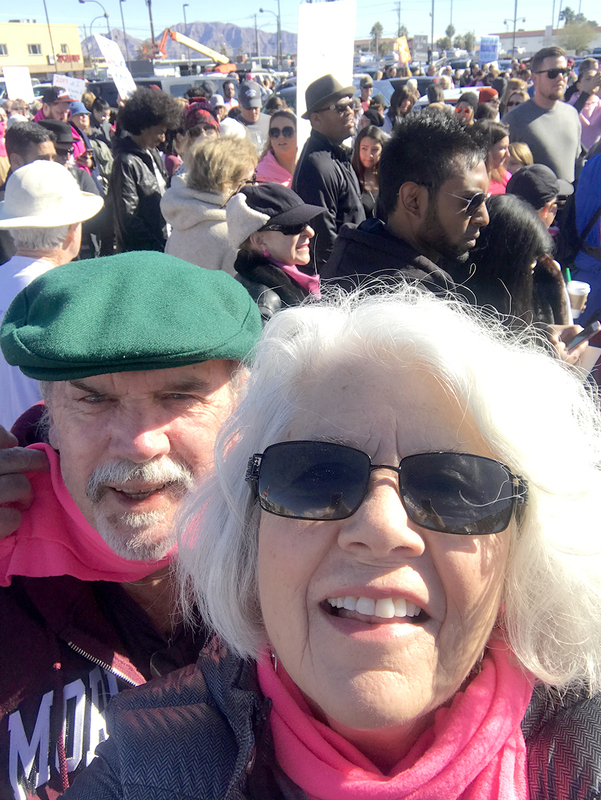 Kathy Maloney (HNHS ’60) (HNU’64) in Las Vegas, NV at the Women’s March Jan, 21, 2017. Her first teaching assignment was with the SNJMs at Our Lady of Lourdes in Oakland CA and went on to teach and be principal in the Oakland public schools for 20 years. Mary Anne Maloney-West (HNHS ’70) marching San Francisco. Barbara Nixon, SNJM, friendly marchers, Dianne Nixon, SNJM. Sophia Park, SNJM with some Holy Names University students and faculty. (L-R): Sisters Kathleen Ross, Linda Haydock, Mary Ellen Holohan and Lorna Cooney. 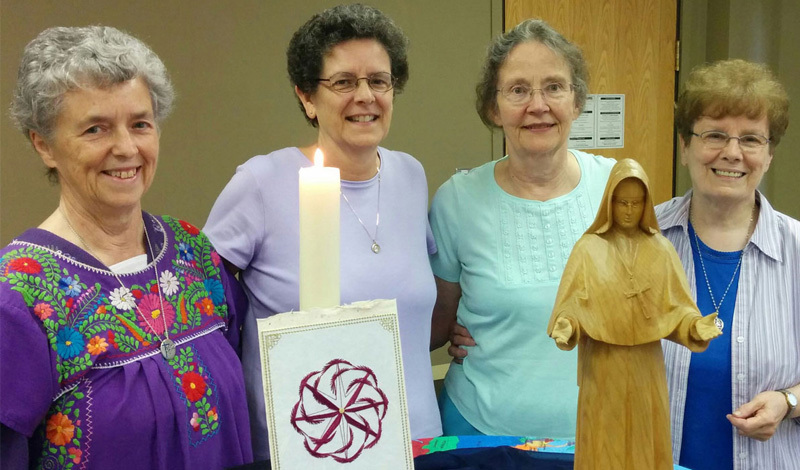 The U.S.-Ontario Province Leadership Team attends the LCWR Region 15 meetings, which happen twice a year. Last week’s meeting in Yakima, WA featured canon lawyer Sharon Holland, IHM and Intercommunity Peace and Justice Center (IPJC) Executive Director Linda Haydock, SNJM (Seattle). Sr. Linda provided a new process booklet for faith sharing called “Privilege and Periphery: Risking Transformation,” which is based on the resolution passed by the 2016 LCWR Assembly regarding systemic injustice. For copies of this reflection process booklet, contact IPJC at ipjc@ipjc.org. 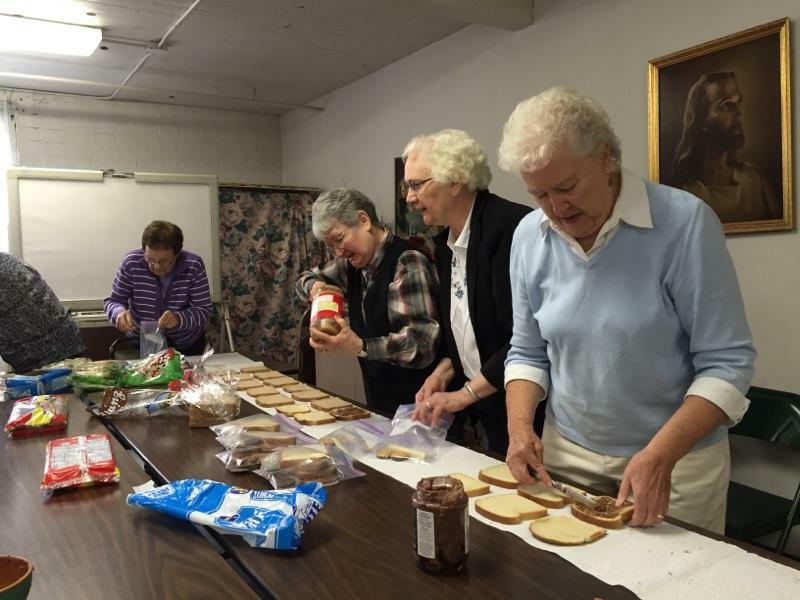 In keeping with the organization’s justice priorities, LCWR members including Mary Rita Rohde, SNJM (pictured at far right) set aside time to make 200 sandwiches to give to homeless people in Yakima. 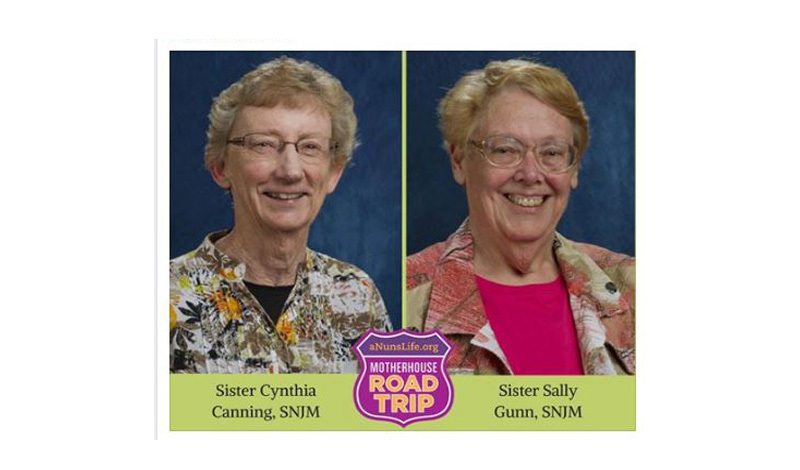 Two Sisters of the Holy Names will be interviewed online on Friday, Oct. 21 when A Nun’s Life Ministry brings its traveling podcast to Campbell, CA. You can join the hosts, Sisters Julie Vieira and Maxine Kollasch, for the live webcast and ask questions of the guest Sisters – Cynthia Canning, SNJM and Sally Gunn, SNJM. During the webcast, Martha Rolley, SNJM, will help take comments and questions from the online community in the chat room and bring them into the on-air conversation.Sister Cynthia Canning has ministered in education and SNJM leadership. She began as an elementary school teacher, juggling two grades in the same classroom. She later served as a high school teacher and principal. She was then called to SNJM leadership, serving six years each in the roles of Director of Ministry and Provincial. In 1994, Sister Cynthia along with SNJM Sisters Rosemary Delaney and Margaret Kennedy founded Next Step Learning Center. The community-based nonprofit continues to assist Oakland-area youth and adults who are seeking to earn their high school equivalency, transition to college, and build better lives. Sister Sally Gunn has served in a variety of ministries. A much-loved junior high classroom teacher, she taught in southern California schools for over 20 years. She served for more than a decade at Our Lady of Grace Parish in Encino, where she worked with the Rite of Catholic Initiation of Adults (RCIA) process and other aspects of parish life. 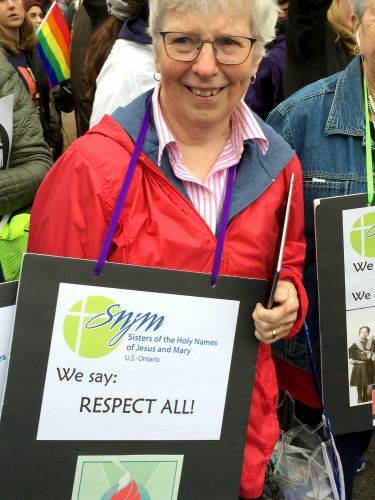 Sister Sally has served in provincial leadership and other roles within the SNJM congregation. She was a key member of the planning team that guided the merging of five provinces of SNJM into the present U.S.-Ontario Province. A Nun’s Life Ministry was founded by Sisters Julie and Maxine in 2006. This online faith community and nonprofit ministry reaches out with a pastoral presence to thousands of people worldwide each day. The website at aNunsLife.org is a place where you can talk with Catholic sisters and nuns and lots of other people on topics such as spirituality, prayer, community, ministry, and more. New to podcasts and chat rooms? Find all the details here for how to tune in to the podcast and use the chatroom. An audio recording of the podcast will be available in the podcast player below a few days after the livestream. You can also have the podcast sent to you as soon as it’s posted by subscribing on iTunes (click on the “iTunes Subscribe” icon on any podcast page) or getting the A Nun’s Life app. Click here for full details about recorded podcasts. Members of the U.S.-Ontario Justice Network met the weekend of Oct. 7-9. 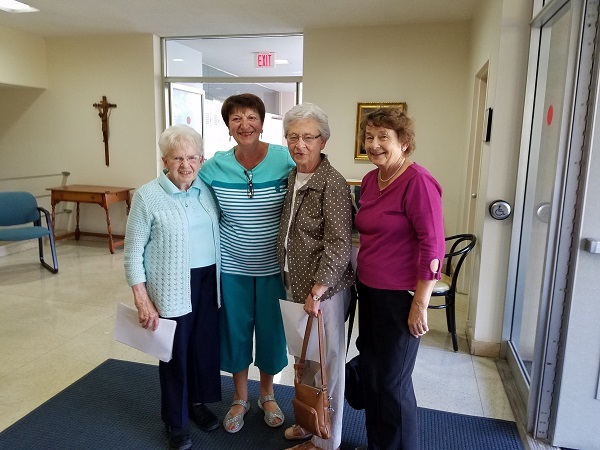 Sister Linda Haydock conducted a workshop focusing on “We Call Ourselves to More” drawn from the Prologue to the Acts of the 34th General Chapter. Mission Centre representatives who attended the meeting committed themselves to further education on human trafficking, water and the environment and the plight of immigrants and refugees. They also pledged to collaborate more purposefully to advocate for others and to promote concrete action as appropriate in their respective regions. A Peace Walk for Justice took place Saturday afternoon. 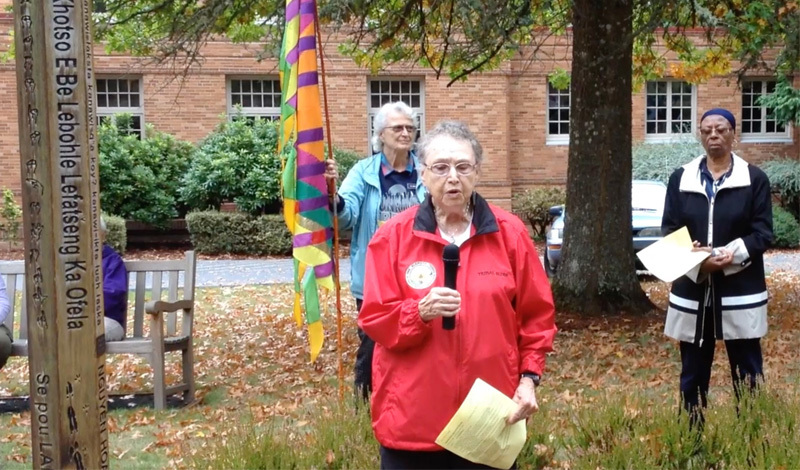 The procession of Justice Network members and guests visited the Peace Pole at Mary’s Woods, the Marylhurst Labyrinth, the Marylhurst University Peace Pole, the Our Lady of Marylhurst shrine and finally the Peace Pole at the U.S.-Ontario Province office. Sister Margaret Ball led the peace walk participants in a prayerful chant during the closing ritual. You’re invited to enjoy this photo gallery of celebrations for Feast of Blessed Marie Rose across the Province. Eileen Kelleher, SNJM, Phyllis D’Antonio, Associate, Marilyn Marx, SNJM and friend of the community Mary Ann Conway wait to welcome Sisters, Associates and friends to the celebration in honor of Mother Marie Rose. 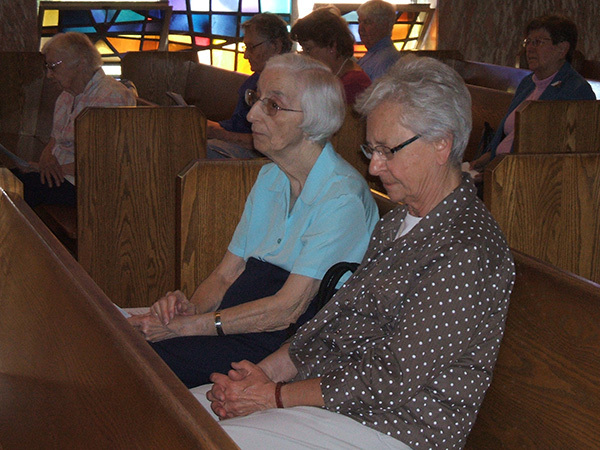 Giovannina Saleeby, SNJM and Marilyn Marx, SNJM spend some reflection time during the prayer service. In the background are Eileen Fitzgerald, SNJM, Mary Elizabeth Lagoy, SNJM, friend of the community Mary Ann Conway and Joan Byrne, SNJM. 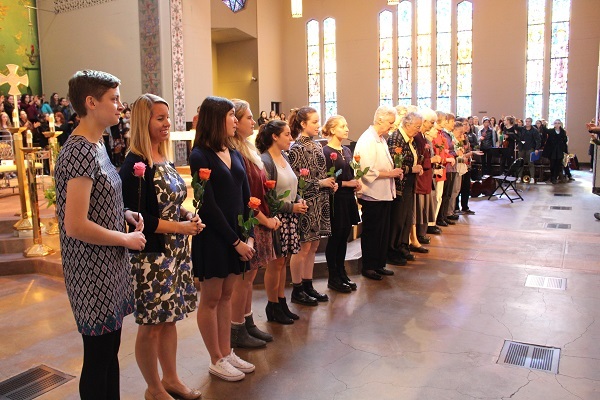 Sisters and Associates joined the Holy Names Academy, Seattle community on Oct. 11 at St. Joseph’s Church to celebrate Mother Marie Rose. Students who volunteered in Jonestown, MS last summer shared highlights of their service that deepened their appreciation of education and their understanding of social justice issues. In addition to the celebration, HNA hosted a lunch for the guests, student volunteers and faculty in the spirit of Mother Marie Rose’s hospitality. 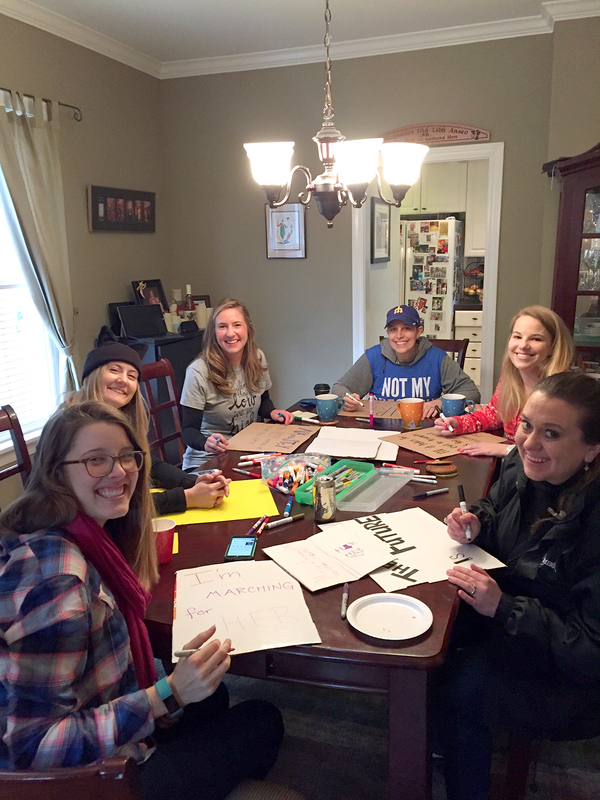 This event was arranged through the initiative of the HNA Charism Committee under the leadership of Julie Tilghman, campus minister. Marilyn Schoeder, SNJM made a presentation about Mother Marie Rose and the SNJM charism to students at St. Joseph School in Salem, OR, where she is a teacher. 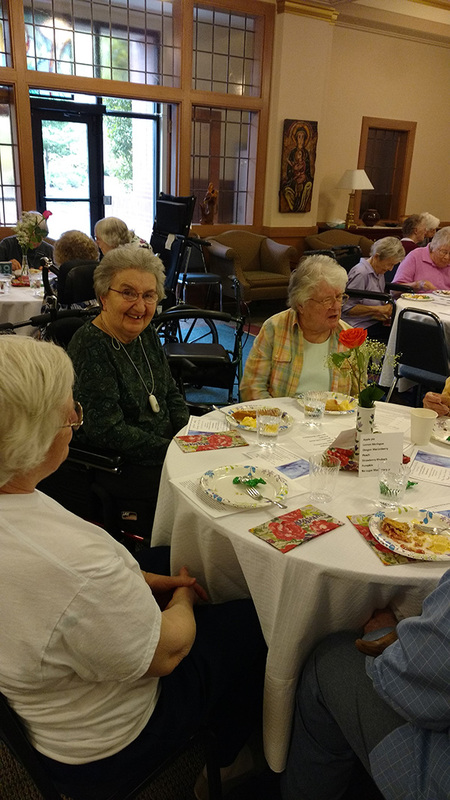 Sisters and Associates gathered at the Devonshire residential center in Windsor, Ontario for a Eucharistic celebration led by Fr. Joe Quinn, CSB. 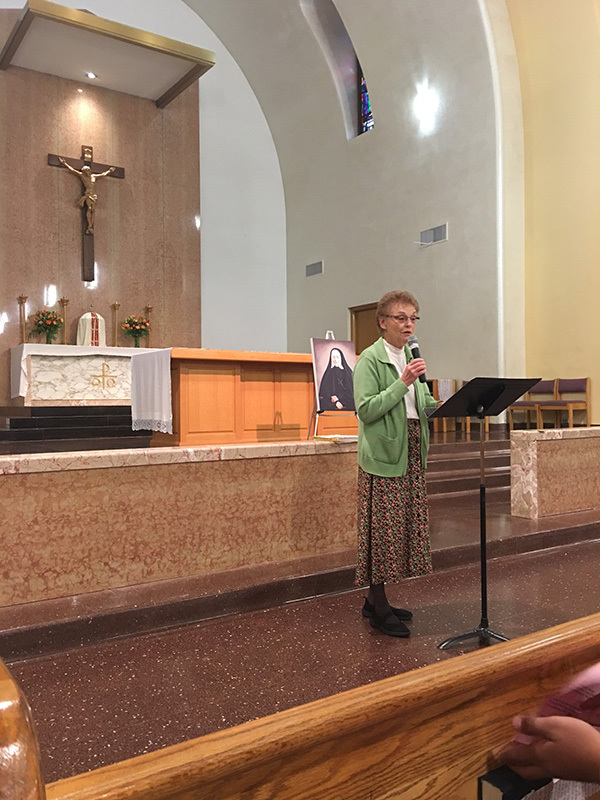 Pat Parachini, SNJM (Mid-Atlantic), who was at Devonshire leading a retreat, was the homilist and spoke of Mother Marie Rose as a contemplative in action, a theme in keeping with the retreat. Sisters and Associates of the Yakima Valley Mission Centre celebrated the feast of Blessed Marie Rose with a special Mass in the backyard of the home of Associates Cecilia Chavez, her husband Daniel and their daughter Elizabeth. L-R: Elizabeth Ortega, Associate, Marina Rose Parisi, SNJM, Deacon Bernie Alvarado, Fr. Jorge Granados and Irma de Prieto, Associate. 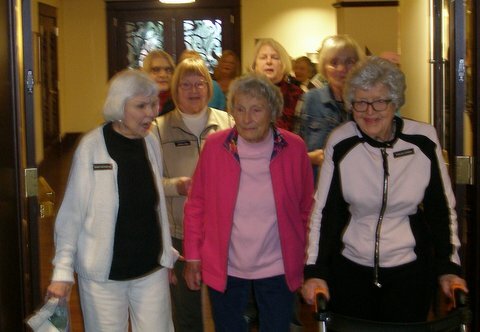 East Bay Sisters and Associates sand a song while gathered at Mercy Center in Oakland to celebrate the Feast of Mother Rose. Watch a video of the singing by clicking on the word “View” below. 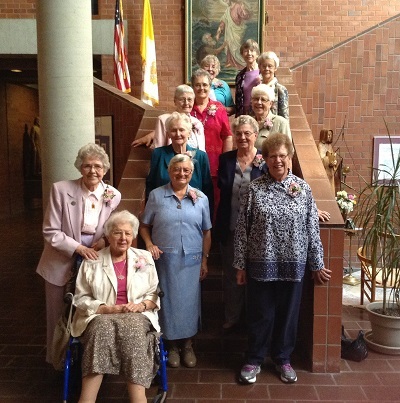 Washington Sisters at a Jubilee celebration in the Spokane Convent of the Holy Names. The Sisters of the Holy Names of Jesus and Mary, U.S.-Ontario Province announced today that Catholic Charities purchased the Convent buildings and a portion of its 65 acre Spokane Campus on Fort George Wright Drive in Spokane, Washington. Catholic Charities plans to adaptively re-use the main Convent building for a new innovative social services program called “Rising Strong” in a unique collaboration with Empire Health Foundation. Empire Health Foundation provided $1.6 million to Catholic Charities to go toward the purchase as a program related investment in this exciting project that will aim to reduce the number of children being removed from their homes by Child Protective Services. In addition, Catholic Charities, in partnership Spokane-based Inland Group, will use a portion of the property to develop affordable housing for both seniors and families, with great care taken to preserve the spiritual and ecological characteristics of the property. 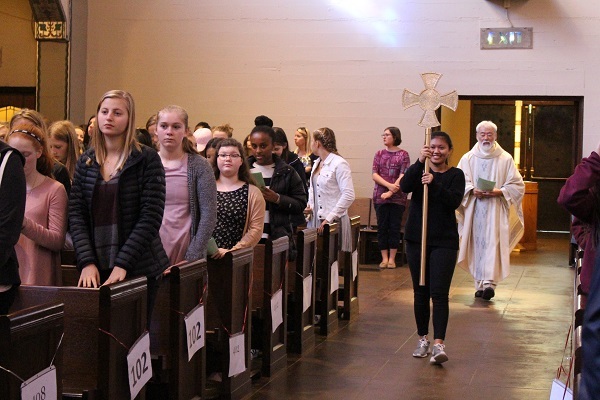 Catholic Charities also plans to retain the Chapel for prayer and occasional Mass and other Convent facilities, in support of Catholic Charities and the Diocese of Spokane’s mission to reveal God’s love to the poor and vulnerable. The Sisters selected Catholic Charities in early 2016 after a two year property evaluation and a selection process that concluded at the end of 2015. The art studio and some of the Sisters’ Administrative Offices, including the Development Office, which focuses on fundraising and donor relations, will remain at the property under a rent-free lease with Catholic Charities. The Sisters also propose to permanently protect and conserve nearly fifty percent of the property, including the entire Spokane River frontage and remaining 31 acres of land surrounded by the River, in collaboration with The Spokane County Conservation Futures Program and other public agencies. The Sisters’ property has been selected by The Conservation Futures Program as the highest priority property for purchase by the program and currently is being evaluated for acquisition by the agency. The Sisters’ Spokane Campus, located at 2911 W Fort George Wright Dr., includes approximately 65 acres, two buildings totaling 77,000 square feet of space with residential living units, administrative offices, a chapel, common dining and recreation areas, an art studio, gathering spaces and retreat facilities. Although the Sisters have used the property for housing and care of Sisters since 1967, the entire property has long been zoned and planned for high density housing by the City of Spokane. Preliminary approvals for development of the property were recently granted by the City of Spokane. The sale price and terms were not disclosed. Craig Soehren and Mike Livingston, Kiemle & Hagood Company, are serving as the exclusive listing broker for the Sisters of the Holy Names for the property sale. About the Sisters of the Holy Names Spokane Campus Long Range Planning Process: Given the age and configuration of the buildings, the demographic profile of the Sisters, and the many changes and advancements in health and eldercare delivery in society, the Sisters initiated a long range planning process for the property more than two years ago. Because the Sisters’ expertise and experience has been focused on their mission of education, the Sisters have looked to others with the needed professional expertise to manage the increasing long term housing and health care needs of its members. 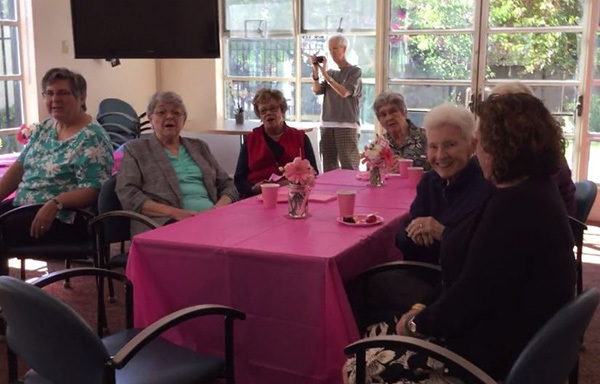 The Province transitioned Sisters from the Convent to Brookdale at South Regal (formerly Harbor Crest) and nearby apartments during 2013-14 for housing and a residence to meet the care needs of individual Sisters. 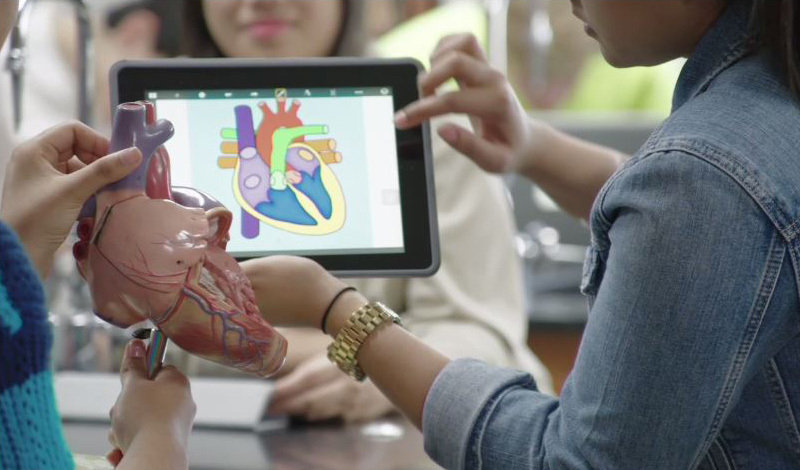 Students learn why heart health is important in a video featured on the Apple Teacher website. Apple has unveiled a program to support teachers who want to use technology in authentic and innovative ways, and it’s been keeping Sister Martha Rolley busy for over a year. Sister Martha is Director of Education Professional Learning Content at Apple. She and her team were responsible for creating resources for the newly launched Apple Teacher program. Its goal is to inspire, train and celebrate teachers as they develop more effective learning and teaching experiences using an iPad or Mac. Educators who sign up for the program gain access to online resources and digital books to expand their knowledge about iPad devices and Mac computers, which schools frequently rely on to assist learning. After participants successfully complete a series of quizzes online, they can receive a downloadable Apple Teacher logo to recognize their achievement and expertise. On the program’s website, which went live at the beginning of the 2016-17 school year, dozens of posts describe how technology is helping students learn everything from English as a second language to the workings of the human heart. Videos, slideshows and articles explain how to take students on a virtual “fly-over” tour of distant cities, create interactive charts to illustrate patterns in data, and personalize learning for students on the autism spectrum, among other topics. Working on the Apple Teacher program was an appropriate project for Sister Martha due to her decades of working in high tech and her dedication to the Sisters of the Holy Names’ historic teaching mission, which especially embraces those who are underserved. Sister Martha has encouraged SNJM educators to enroll in the program, both to earn recognition as an Apple Teacher and to learn more about the technology they and their students use in Holy Names schools.